re:TH!NK received a USDA Farm to School grant in November 2013 to help with implementing the Northeast WI Food Hub among other initiatives related to Farm to School. With this grant, re:TH!NK worked with county school districts to implement ‘Fun Food of the Month’ into local cafeterias, allowing students to sample healthy, local foods. An AmeriCorps Farm to School member has supported re:TH!NK Farm to School efforts starting in 2014 supporting nutrition education and community outreach around healthy, local foods. Winnebago County Farm to School was awarded a Healthy Eating Active Living Grant from Ministry Healthcare Systems in 2016. 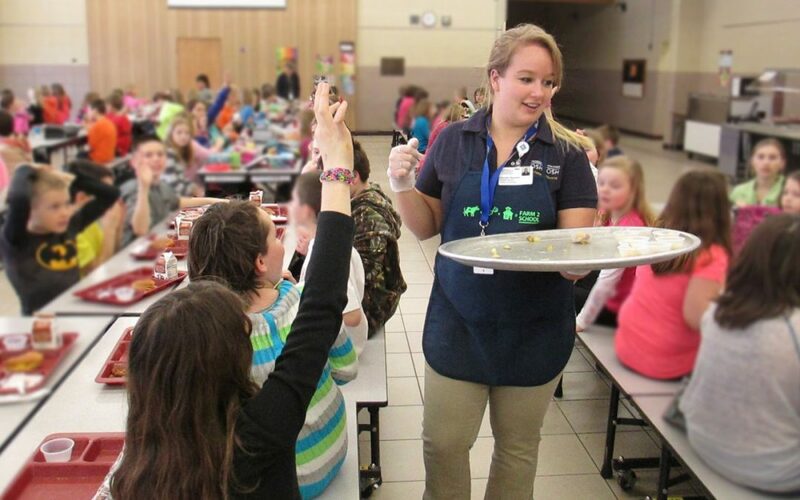 This grant allowed all 5 school districts in Winnebago County to build their capacity to serve minimally-processed, local produce during their school lunch by funding food processing equipment and local food sampling in elementary cafeterias.